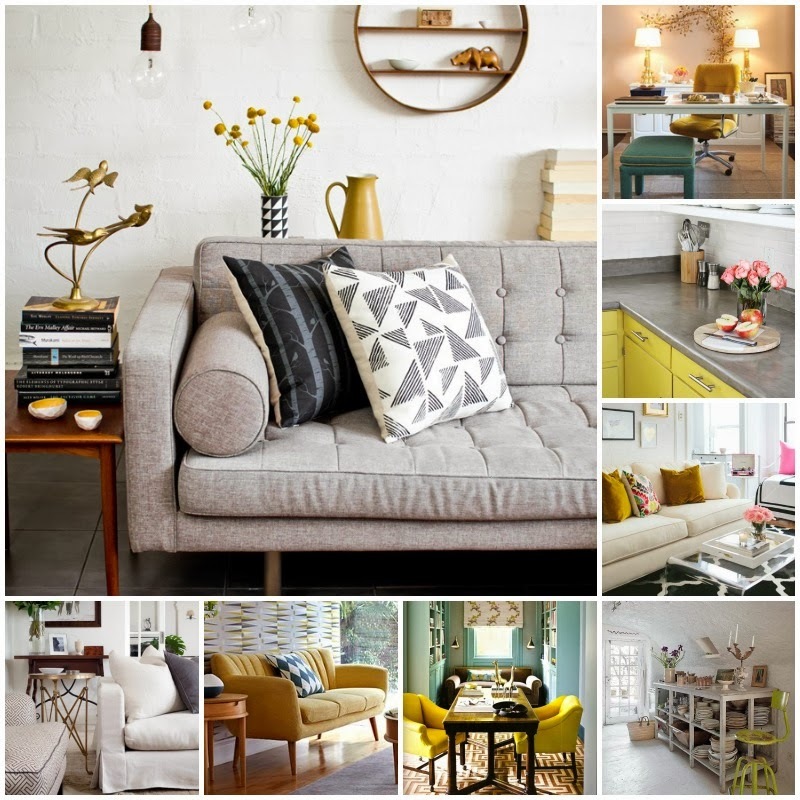 If you follow me on Pinterest, you may be aware of my grey/yellow colour combination obsession. If not, above as a little summary... think grey and cream walls, sofas and tiling, with pops of yellow in the furnishings. Swoon! I love the rich, almost golden shade of the yellows above - can anyone tell me what this shade is called?! It must have a name! Combined with cool silver and muted grey tones, this is interior perfection in my eyes. I think the key is keeping the pops of colour small and/or simple. Be it a clean cut sofa, arm chair or stool, a luxurious velvet cushion or colour pop cupboards. There are so many ways to inject some of your taste into your home! Get some cool prints framed (PosterLounge do some great ones) to get up on the walls and help carry the theme through. Don't go overboard though; subtle bursts of colour are cute, a garish, clashing mess might give you a headache! And most importantly, finding ways to achieve the look you want within your budget is crucial - you don't have to spend loads for your home to look classy! The items below are all available on the highstreet and are super affordable. The idea is to look around - on the highstreet, but also in charity shops, junk shops and carboot sales. I love that eclectic look. What do you think? Do you love this colour scheme or have I gone interior-cray? I LOVE it!!! Im about to start redecorating and was going to go monochrome with pops of yellow and blue but was starting to worry it would be too harsh but now am thinking that greys/creams and pops of the colour would work better! Thanks so much! 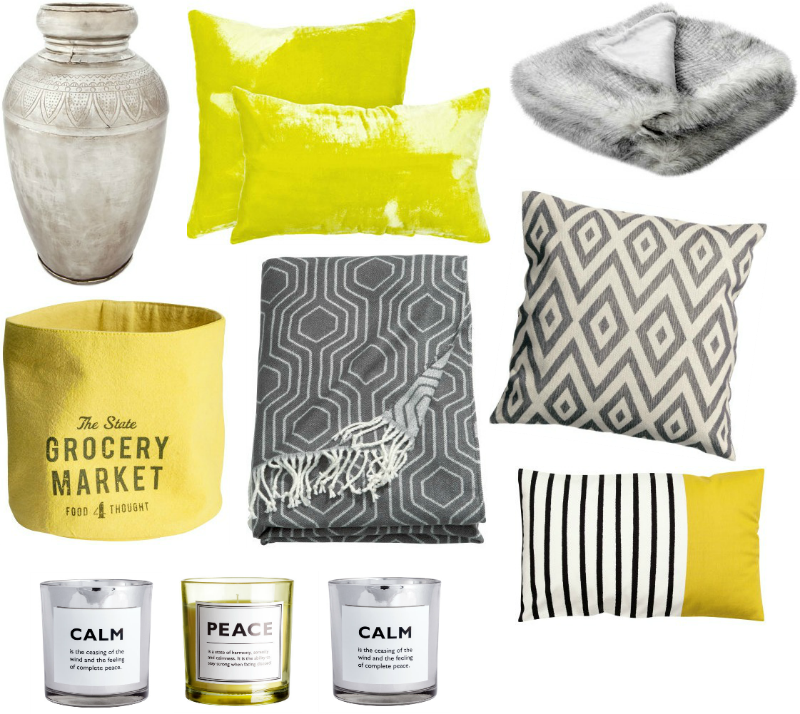 I love the lemon/striped cushion and candle set... they're giving me spring fever! Grey is such a fab neutral for homeware stuff, we have grey and turquoise which I love!